This summer travel season, don't forget that metro etiquette varies widely between cities. These sorts of gaffes seem to be amplified on public transit. Push your way onto a subway train in Copenhagen and you blend in – according to Danish friends it’s the one place in Denmark where mild social aggression is tolerated. Try the same thing in Glasgow and … well, just try it and see. 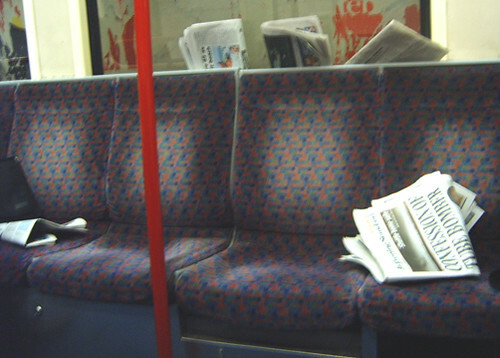 In London, dumped newspapers on trains are a form of courtesy. In Vienna, they are treated like something dead that the cat’s dragged in. In other words, it always helps to know the local rules. Talking to friends around Europe, I’ve compiled this summer travel season guide of specifically local subway do’s and don’ts in some of the continent’s major capitals. Manners on London’s Tube system are a typically British brew of tension, tolerance and passive aggression. In some ways, rules can be surprisingly lax. You can eat food, even stinky food, without being reprimanded, though if you’re a woman you risk being shamed for it on social media. Drinking alcohol has fairly recently been banned, but it used to be the accepted rule on weekend nights (as these 1980s photos show). As for littering with newspapers, it’s actually considered polite to dump reading matter for other passengers to pick up, even though it leaves cars looking like a junkyard. Admittedly, the Tube is a free-for-all tidiness-wise not because people don’t mind, though it’s true that British people's general messiness shocks many visitors from Southern Europe. It’s more that, thanks to a combination of fear and inhibition, Londoners generally prefer to tut inwardly than actually speak up. They’re not entirely wrong – there are a enough British people out there who can go from mute to berserk in 60 seconds. This inhibition evaporates immediately, however, when it comes to the London Tube’s cardinal sin: standing on the wrong side of the escalator. In London, time is short and escalators are long. If you are a clueless visitor standing on the wrong side of one, rest assured that the people who don’t actually barge past you are probably mentally running you through with a samurai sword. And when I say “people,” I mean me. In the German capital, subway rules are the opposite of London’s. Riders tend to be freaked out by untidiness or disorder, but they aren’t in as much of a hurry. Leave a paper behind on the seat, and you’ll often get barked at – I’ve been snapped at for leaving papers I’d never even touched. Eating food is also a no-no, which is fair enough. If you break the rules, don’t be surprised if Berliners are vocal about it. This is partly because low-level grumpiness is more socially acceptable in Berlin but mainly because, with a moderate crime rate, people just aren’t as scared as each of other there. But if Berliners are uptight about space, they’re more relaxed about time. Even when they have your coins, Berlin subway ticket machines pause and have a little think before they deign to print your ticket. Berliners stand wherever they want on their (short) escalators – if anything, it’s the people who try to hustle past who are seen as the rude ones. Being in a hurry simply doesn’t give you a free pass for bad behavior here – you can be reprimanded by a station guard for holding open a closing door. That guard would be right, however. Trains wait a decent amount of time in stations and announce clearly when you should get on (“einsteigen”) and stay back (“zurückbleiben”), so there’s really no excuse. If jamming the doors is taboo in Berlin, in Paris it’s mandatory. Metro doors stay open so briefly before they buzz and slam that it can be nigh impossible for a crowd to get on without someone using a foot as a wedge. This extremely short board time could explain the air of persecution on Paris’ metro: you feel as if the entire system is hectoring you, basically because it is. At the same time, it gives you a chance to show good manners. While officialdom strongly discourages it, it’s considered polite in Paris to hold the doors so everyone behind you has time to jump on too. Fail to do so, and you may pull out of the station watching someone’s shaking fist fade into the distance. Where the Paris Metro shows its more laid-back side is with body contact. French people require a far smaller bubble of personal space than Americans, and it’s considered perfectly normal in Paris to have legs matched hip to ankle with your neighbor – with limited room, there’s not much choice. This is also why people generally avoid eye contact and chatting with strangers. They’re trying to make up for a surfeit of physical intimacy by counterbalancing with a deficit elsewhere. Paris also has its own vital locals-only rule. Metro trains have flip-down jump seats by the doors – these should always be emptied and flipped up when the train is busy. Fail to do this, as shown in this Paris Metro poster encouraging courtesy, and you’ll find yourself staring at a resentful crowd, or at least their crotches. To be fair to Parisians, the city has made some real attempts to improve its poor reputation for manners on the metro, whether it’s high-profile campaigns like this one or etiquette manuals that state what should be obvious. To a northern European like myself, the Roman metro seems to be a place of no taboo. In London’s rush hour, subway riders stand crushed together in silence. In Rome, they stand crushed together talking at the top of their voices. No one does hushed whispers here, which could explain why no one feels the need to pretend they’re not eavesdropping on each other’s conversations. If it’s considered rude to push onto a Roman metro train before all passengers have alighted, then it’s a rudeness so widely tolerated as to be almost ubiquitous. Getting off a car can be a struggle: so great can be the press of people who can’t be bothered to let you off before they get on. Escalators, meanwhile are stately and almost exclusively for standing on. This might all sound like hell, but Italians sometimes feel the same about London’s Tube, wondering what intense psychic pressure must be in place to enforce all that queuing, shuffling and silence. There’s one area where Rome leaves a lot to be desired. According to an Italian friend, there’s an unfortunately high instance of men who can’t keep themselves to themselves at rush hour. Her way of dealing with it is to grab any roving hands and ask loudly “Has anyone lost this? I found it on my…[insert name of relevant body part here].” Apparently, it works. Are you worried about the younger generation’s lack of manners? Then take a ride on the Athens Metro and have your assumptions shaken. In Greece’s capital, it’s younger riders who are generally the more patient and well behaved. Find yourself jostled while getting on a train or notice someone pushing in front of you at a ticket office, and the likelihood is that your antagonists hair will be salt and pepper at least. So why are older Athenians pushier? A possible explanation is that, in a country that became overwhelmingly urban only after World War II, an etiquette system designed for making metropolitan living smoother took a generation or two to develop. Beyond the odd jostling granddad, don’t expect Athens Metro to be a free-for-all. Sure, it has the usual stand-where-you-like escalators and occasional gauntlet of boarding passengers who don’t want to let you off first, but the metro’s newness (most of it was completed in 2000) and preponderance of well-mopped marble somehow helps keeps people reined in. In fact, it’s practically the only place in the city where the smoking ban is actually obeyed (including Greece’s parliament). It does have one unusual feature, however: a far bigger than average overlap between people going to work and those coming home from a night out. While Greeks work long hours (more per week than anyone else in Europe) they also go out far later – A nightlife-loving Athenian friend of mine almost had his teenage social life ruined by a tough 4 AM curfew. In northern European cities, this might mean hardworking people being exposed to a leery crowd of drunken idiots (confession: I have probably been that idiot), but Greeks aren’t the world’s heaviest drinkers and, like I say, young Athenians are a relatively well-behaved lot. With the economic crisis pushing taxis out of more people’s reach, this trend has only got stronger.